Background: Emergency nurses play a pivotal role in disaster relief during the response to, and recovery of both in-hospital and out-of-hospital disasters. Postgraduate education is important in preparing and enhancing emergency nurses’ preparation for disaster nursing practice. 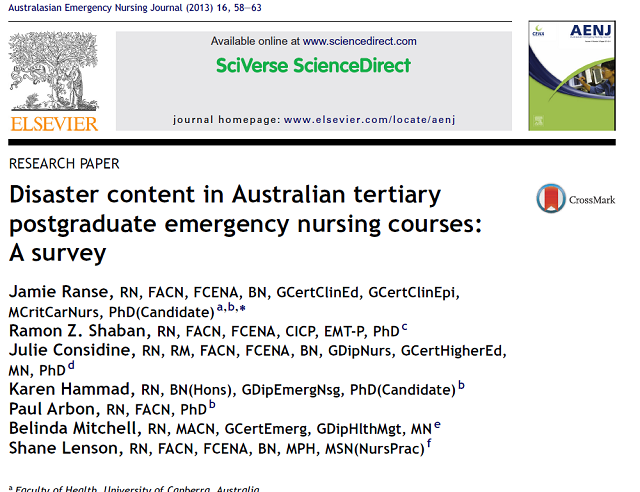 The disaster nursing content of Australian tertiary postgraduate emergency nursing courses has not been compared across courses and the level of agreement about suitable content is not known. 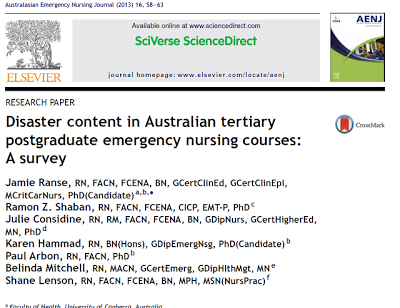 Aim: To explore and describe the disaster content in Australian tertiary postgraduate emergency nursing courses. Method: A retrospective, exploratory and descriptive study of the disaster content of Australian tertiary postgraduate emergency nursing courses conducted in 2009. Course convenors from 12 universities were invited to participate in a single structured telephone survey. Data was analysed using descriptive statistics. Results: Ten of the twelve course convenors from Australian tertiary postgraduate emergency nursing courses participated in this study. The content related to disasters was varied, both in terms of the topics covered and duration of disaster content. Seven of these courses included some content relating to disaster health, including types of disasters, hospital response, nurses’ roles in disasters and triage. The management of the dead and dying, and practical application of disaster response skills featured in only one course. Three courses had learning objectives specific to disasters. Conclusion: The majority of courses had some disaster content but there were considerable differences in the content chosen for inclusion across courses. The incorporation of core competencies such as those from the International Council of Nurses and the World Health Organisation, may enhance content consistency in curriculum. Additionally, this content could be embedded within a proposed national education framework for disaster health.